Habitat: Wormwood is native to temperate regions of Europe, Asia and northern Africa. It can be found on waste places and uncultivated ground, on rocky slopes, roadsides and at the edges of fields. Description: Wormwood is a herbaceous perennial plant, growing up to 1.5 meters in height. It has a woody rhizome and erect, branched stem, silver-green in color. Leaves are gray-green, spirally arranged and covered with soft hairs. Basal leaves are up to 25 cm long, divided into deeply lobbed leaflets. The other leaves are much smaller ( 5-10 cm ) and less divided. Flowering occurs from early summer until the beginning of autumn. Flower stalks emerge from the upper leaves axils. Flowers are yellow and tubular, clustered in bent-down heads. The fruit is a small achene; seed dispersal is by gravity. Useful components: Silica, absinthin, anabsinthine, thujone, tannic and resinous substances, malic acid, succinic acid. Medicinal use: Absinthe wormwood is considered to be an anthelmintic, antiseptic, antispasmodic, carminative, cholagogue, febrifuge, tonic and stomachic. 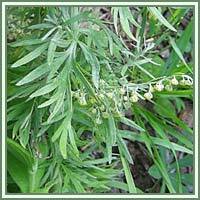 It is often recommended in treatment of indigestion and gastric pains. Absinthin and anabsinthine are the key substances for stimulation of our digestive tract and improvement of gallbladder functions. Wormwood tea can help alleviating labor pains. Oil made from the plant is used as a cardiac stimulant, improving blood circulation. 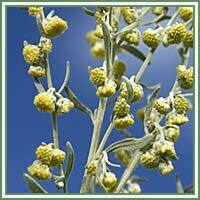 Combined with other herbs, Wormwood can be an excellent remedy against heartburn and irritable bowel syndrome. Safety: Pure wormwood oil is very poisonous, but with proper dosage and under the supervision of a health care professional, Wormwood poses no danger. It is advisable to consult your doctor before consumption of any herb.